The Sisters reached the source of their quest, and found it strange and frightening. One of the navigators called the captain to the bridge. "Sir," he said in a tone as coldly dead as a grinning midnight moon, "I think you want to see this." It was a gargantuan construct. It eclipsed the stars. The captain had never seen anything like it in his life. At some point there had been rock there, with shards of unrefined ore poking through its surface like shards of bone from an open break. The rock could still be glimpsed but was completely dwarfed by the intricate architecture of metal and electronics, layers upon layers that interweaved like the veins of a mechanical god, dead or dreaming. The human eye could not possibly take in the entire sight at once, nor comprehend each of its components: The nooks and crannies that were nonetheless large enough to house entire battleships; the craggy spikes that jutted everywhere like antennas listening for incomprehensible voices; the blocks that looked like half-built housing for Titans; and the walls, on every side, with thousands and thousands of glittering windows, glowing in the dark with the light of the vast unknowable. It was a station of stations, a collation of superstructures that seemed to constantly reach for the viewer's gaze. The construct took the Sisters' speech away. And it was only after they had caught their breath that they realized it was not dead. Not moving, for movement implies life, but inhabited, possessed; and whatever had claimed or made this monster was writhing all over it. They were rogue drones: Mad, sentient machines as close to alien life as New Eden had ever seen. They crawled over the surface of the station in the hundreds, constantly mending and altering. As the captain looked away, disgusted and awed in equal measure, he saw hundreds more, possibly thousands, drifting in and out of the station's many openings, and even more still flying to a nearby blue star. A navigator said, "Sir, this is the source. That signature we were after. It's here. That ... thing, it's full of it." "Keep talking to me," the captain said. Everyone's eyes were fixed on the terrible drones. "What are we looking for? I will not believe it's the drones themselves." The navigator, gratified to have something else to focus on, got busy on his datatable. "Sir, the whole hive is a storehouse of a material called isogen-5. It's remarkable, sir. Quite amazing." "The mineral is incredibly rare, sir. I've been running scans for many years now, and I'm of course very familiar with all the theoretical backgrounds, but I don't recall ever coming across one like this before. According to our database, it's so rare that I doubt you or I or anyone else would ever have seen it throughout all our lives if we hadn't been looking for it." "Sir, it was half believed to be only a theory until this point. We know next to nothing about it except that it's incredibly volatile and found only in the presence of Type O stars. Blue ones." The captain looked at the star in the distance and sighed. "No, someone else found it first, apparently." The captain tore his gaze away from his camera drone screens and looked at the data the navigator had pulled up for him. The isogen-5 glowed bright as a furnace in the rogue drone hive, but there were little embers of it floating around nearby. The drones were collecting it, he realized. He had his attention redrawn to the drone hive. His initial disgust was swiftly giving way to amazement and wonder. The drones were picking up the isogen-5 like harvesters in a field, obeying some law of a nature that was utterly alien to the Sisters. Even here, in this place of a strange and mad new life, there was order and routine. The captain's confidence returned. He and his team had been brought here, to see these sights, and to communicate with these entities. In mutual humility and brotherhood. "Sir, there is something else. It's only showing up on our scanners because we know to look for it." A tiny red dot hovered in the center of the screen, somewhere in the mess of the hive. The crewman zoomed in, and zoomed again, magnifying their view until the entire screen was filled with the glinting surface of the hive wall. The red dot became an outline. It was an Abaddon, an Amarrian Battleship. "It's on the other side of the station, sir. And it's permanently cloaked, undoubtedly by some power source controlled by the drones. I caught it because it contains a cache of isogen-5." The captain opened his mouth to ask, but the answer launched itself into his mind like a firework. The realization hit him so hard that he had to grip the railing, his knuckles immediately turning white with the effort. "Sir? Are you all right." He didn't dare believe it yet. It was there, but it couldn't be there. "I want you to confirm a few things for me," he said, enunciating each word with exquisite care. "First, the signature we've been after all this time, the one we picked up from the EVE gate, matches the one in our records of the cataclysmic battle during the battle between the Amarr Empire and the invasion force from the Minmatar Republic." "And from my own experimental data, available only to the crew on this ship, this same signature then led me directly to the home court of the Empress herself, and eventually to this place where we find an Abaddon." "I want you to scan this ship. Any way you can. Tell me if there is anything out of the ordinary with it, other than it being used as a storehouse for isogen-5:"
The room was quiet. Everyone sensed that something was happening. After a good long while the crewmember said, "There is, sir. I can't launch proper scan probes that'll get past the drones, but the data seeping from the Abaddon's power systems and our lock on the isogen-5 signature allowed me to sketch out some parts of its interior." "It's like no ship I've ever seen, sir. Whatever's inside it, it's given over entirely to some vast mechanism that takes up a good deal of the ship's interior and definitely involves the isogen-5. The ship's forward superstructure also has several release points not usually found on vessels of this design. Some kind of particle emitter technology that's been rigged onto the mains. I can't explain their function except that they look like hybridized conductors of some sort." "And the isogen-5 is part of all this?" "Sir, if I didn't know better, I'd say the isogen-5 is being used as fuel for the whole clockwork. Or ammo." The captain breathed deeply. His faith had been rewarded. This was it. The whole thing; the gun and the bullets. The flame and the fuel. The fabled superweapon and the isogen-5. It was everything they needed. He let go of the railing and took a deep breath. "Come with me, Haatanen. And you, Jora, and Beteal." The captain waited until they had all gone in and the door had closed. They took their seats at a large table whose plate was of opaque glass, as many holotables were. The captain called up a smaller version of the main screen and had it projected up from the table. The Abaddon's red outline hovered before the team's eyes. "We have a choice here," the captain said. "I do not believe it is any kind of choice at all, but every man needs to feel they're on the given path of their own volition. "On the other side of that hive is the superweapon Jamyl Sarum used to repel the Minmatar invasion. It is the largest, most powerful weapon the world has ever known." He paused, surveying his people. "I want it," he said. They did not move to speak, which he took as a good sign. "We obviously need to get past the rogue drones to get it. There is no way we can do this by force, not with our situation. The entire unified power of the Sisters might do it, if we were lucky and deathless. More likely we would need to pull in other allies, by which time we'd either be enmeshed in an unsolvable diplomatic mess, or the weapon would simply be gone. It got here somehow; presumably it can disappear just as easily. "Before I make my proposal, I want you to consider the nature of this amazing, amazing weapon. It is not the end of life, nothing so dramatic; nor is it merely the biggest cannon in existence. It is the beginning of a new era, of peace and prosperity, at so long last. It is the leverage we need to bring the Empires to hell, them and the murderous capsuleers." He paused, and looked each one of them in the eyes. "But Control won't see it that way. The moment we involve the faction, the weapon is effectively destroyed. Doesn't matter whether we give it away or manage to keep it for ourselves, Control would see to it that this magnificent creation of forcible peace would be dismantled. At most the Food Relief corp would use it for some momentary diplomatic wrangling, but even they wouldn't fight to keep the thing for long. "So we have a superweapon here. And based on the traces of isogen-5 in its core, the same isogen-5 the drones are harvesting, I would say we have found its fuel source. The gun and the bullets, within our reach. All we need is our hand on the trigger. "I want us to engage the drones in dialogue." "We will seek passage in the name of the Sisters and of humanity, something we have done with great success in the past. No one, not even the bloodiest of the Sani Sabik or the most haunted of Sansha's slaves, has ever denied us passage in times of true need. "We were brought to this place for a reason, and I believe that on the other side, in clear view, is our holy grail." He sat down and laced his fingers behind his head. Everything he had said, he felt, was as true as anything could ever be. The weapon needed to be theirs. "Sir ..." one of the navigators said. He faltered, cleared his throat and began again. "Sir, I've been on hundreds of missions for the Sisters, and this thing is death incarnate." The captain fixed him with a glare. The other navigator said, "It's ... frightening. But I have never questioned my superiors. This is what we signed up for." The first said, "This is not what we signed up for. Death and destruction is not what we signed up for." His cheeks were bright red. The second replied, "But this is where we are, and this is the choice we have to make." The team debated, and the captain allowed it to proceed to a vote. Shortly after, they all left the room, the decision made by majority. Strangely enough, and unknown to the captain, each of the persons inside the room had their own ideas of what would be done to the weapon once it was retrieved, and what would be done to their captain. They went forth and gave their orders. The ship moved on. The drones noticed them and started their targeting, but did not yet engage. The crew felt the sinking weight of a hundred different red crosshairs aimed directly on them. The team opened a communication channel. And a message made its way from the captain's lips, through the ship's computer, and was broadcast to all drones in the vicinity. It sought passage in the name of the Sisters of EVE and of the humanity of life, adding that this was not a new occurrence by any means. It explained the nature of their belief, which was rock solid in uncertain times. For good measure it added a brief history of the Sisters' accomplishment both humanitarian and scientific, concluding with a suitably simplified repetition of their request that the drones acknowledge the Sisters' higher purpose and right to passage, and let them through. The message seemed to have no effect. The channel did not report acknowledgment or acceptance. The captain realized with a sinking feeling that these things might never have been asked to give humans passage based on goodwill. He did not even know if goodwill meant anything to them. Eventually the drones started to move. One of the navigators, the person in charge of communications, shook his head. In a tone as steady as he could keep it, the captain asked, "Did they say anything?" The navigator gave him a worried look and said, "Sir, I think they did. But I don't even know if it's in response to us." "Speak, man! What is it?" The drones were moving closer now, their pincers and claws at the ready. "Sir ... it's an endless string of binary. Ones, over and over again." 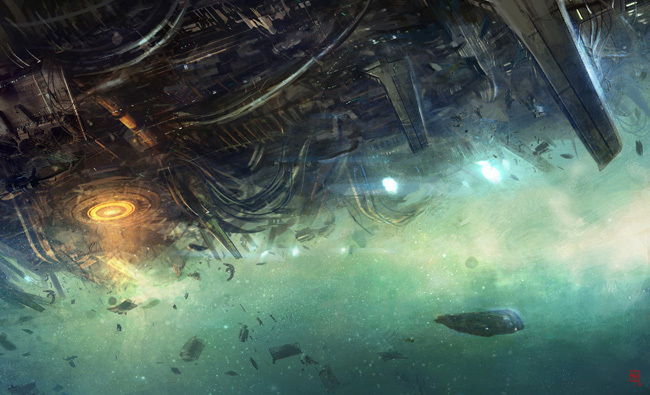 The first few drones took down the ship's shields like they were wading through fog. The second wave latched on and immediately started piercing its armor with their massive pincers. The vessel's guns picked off one or two, but before any more shots could be fired, the drones had broken through. And the ship's captain learned that faith is not enough, for faith is blind by nature. Life needs insight. It is the dead, and the dying, that allow themselves to be led.